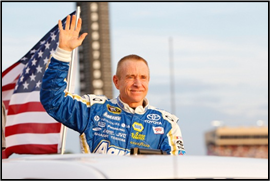 CORNELIUS, N.C. — Mark Martin might not be as tall as Shaquille O’Neal, enjoy the punching power of boxer Jake LaMotta or the foot speed of football star Marshall Faulk, but the 30-year NASCAR veteran’s stature in the sports world is as large as any of the guests who will attend Monday’s 27th annual dinner to benefit the Buoniconti Fund to Cure Paralysis. Celebrities across the sports world will gather at the Waldorf Astoria in New York City for the Great Sports Legends Dinner. “I can’t wait for this,” said Martin who won’t be racing at New Hampshire this weekend but returns to action at Dover on Sept. 30. Martin, 53, a 40-time NASCAR Sprint Cup winner, joins stars like Bob Costas, Tony Perez, Joe Torre, Alonzo Mourning, Lisa Leslie, Lorena Ochoa, and Emilio Estefan at the dinner. In 1985, Barth A. Green, M.D. and NFL Hall of Fame linebacker Nick Buoniconti helped found The Miami Project to Cure Paralysis after Nick’s son,Marc, sustained a spinal cord injury during a college football game. Since then, The Miami Project has become the world’s most comprehensive spinal cord injury research center. With over 200 doctors, scientists and clinicians affiliated with the University of Miami Miller School of Medicine, The Miami Project has made unparalleled and spectacular findings in its efforts to find a cure. Indeed, it has generated hope for millions of people worldwide paralyzed by spinal cord injury. Committed to finding a cure and to seeing millions worldwide walk again, the Buoniconti family established The Buoniconti Fund to Cure Paralysis, a non-profit organization devoted to assisting The Miami Project achieve its national and international goals. The Fund’s Board, comprised of many prominent Americans, ensures that the messages of both The Buoniconti Fund and The Miami Project are seen clearly and positively by an ever-increasing audience. With Volunteer Chapters in cities throughout the country, The Buoniconti Fund serves as the fundraising arm of The Miami Project. It is designed to complement the scientific accomplishments of The Miami Project by generating high levels of awareness and funds.